$OCC_PATH notification:generate $ADMIN "$NUM_PACKAGES packages require to be updated" -l "$UPDATE_MESSAGE"
$OCC_PATH notification:generate $ADMIN "System requires a reboot"
This at least made it work on my Raspberry Pi which runs Raspbian. any way to make this work for debian? I think it should work on debian as well? At least that’s what the docs said. I had to install “update-notifier-common” and put "php " before “$OCC_PATH”. Too bad pacman doesn’t have an equivalent to apt-check - this is really nice! Thanks a lot! I’d love to have that feature. But i cant seem to get it working. and changed the path and admin vars in the script. (sudo -u www-data php /path/to/nextcloud/occ notification:generate admin “test”). And i checked that apt-check works for www-data. Any idea what i might be missing? Can you run sudo -u www-data /path/to/file/system-notifications.sh manually? Or does that maybe error? 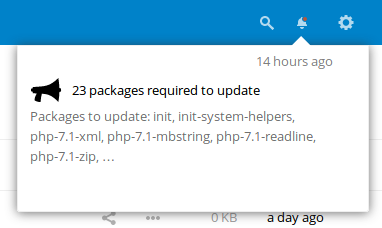 ($OCC_PATH notification:generate $ADMIN “$NUM_PACKAGES packages require to be updated” -l “$UPDATE_MESSAGE”). But as i know it shouldnt be necessary to mark it as such?! but i had to add “php” to the OCC_PATH variable?! should that be fixed or is it just related to my setup? For reference: i think it’s possible to edit the script for arch linux using checkupdates instead of apt-check. think it’s possible to edit the script for arch linux using checkupdates instead of apt-check . No, you have to added it. I correct this issue and added check if user is the same as OCC owner. Also will create Log line with status. Works good under debian and ubuntu. # AS-IS without any warranty.